The showing of Suffragette coincides with the Art Plumstead Plumstravaganza, the end of two weeks of arty happenings and Plumstead Open studios. 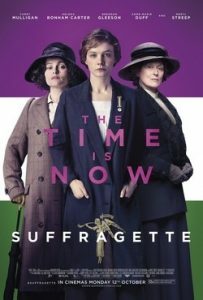 The Woolwich and Plumstead Roses WI will be baking cakes and providing tea, donned in Suffragette colours green and purple. Period dressing up very welcome. The bar will be open and the Plumstravaganza closing event starts at 7pm.